What fuels hype? More people are turning to them. While researching and interviewing for the podcast it quickly became apparent that this hype is not benign. Hence, the Twitter chat. Many of these academics participated in the chat and shared links to the latest research. Short of attending a major conference — as Tumilty points out — a Twitter chat like this offers one-stop shopping for writers looking for background materials, potential interview sources, and new story ideas. Each one of these topics could, on its own, generate enough material for an in-depth piece of investigative journalism: What are some examples of stem cell hype in news stories, PR, and advertising ? How do we stop the hype? The very idea that when we raise a topic, at a certain point in time, and hear what people are saying (or, what they’re not saying), it has tremendous value. 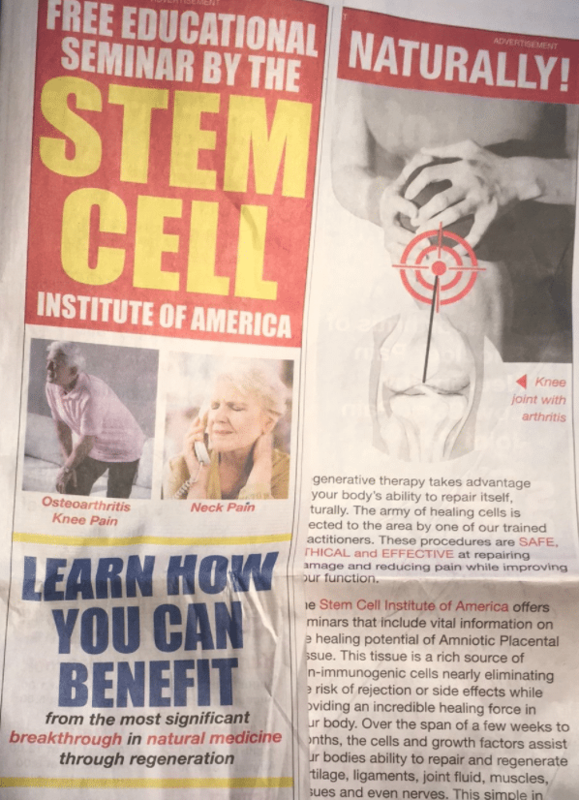 In the case of stem cells, that exaggeration seems to reflect all that is dysfunctional about direct-to-consumer marketing. I’ve been thinking about this quite a bit since we hosted a Twitter chat last week addressing #stemcellhype (summarized HERE on Storify). We wanted to explore the boom in unregulated stem cell clinics offering unproven therapies across the country. These clinics are being marketed in an increasingly aggressive and mainstream fashion. More people are turning to them. More are being hurt. Yet their growth continues unchecked. So our first response was to produce this podcast. While researching and interviewing for the podcast it quickly became apparent that this hype is not benign. Also, many of the voices warning others of this aren’t being heard nearly enough. Hence, the Twitter chat. First, although direct-to-consumer marketing may shout louder and further than academics, many concerned scientists and researchers are generating a substantial and meaningful body of work that clearly documents the ethical, clinical, legal, and scientific problems with these dubious therapies. Many of these academics participated in the chat and shared links to the latest research. The sheer volume and quality of the resources shared during the chat was impressive.